Featuring the cinematic vision of cutting-edge Director/Writer Timur Bekmambetov, DAY WATCH (DNEVNOI DOZOR) is the next installment based on the best-selling sci-fi novels of Sergei Lukyanenko. When the previous installment, NIGHT WATCH (NOCHNOI DOZOR), was released in its native Russia in July 2004, it became an instant smash hit breaking all film gross records in post-Soviet history. Made for a mere $4 million, the film out-grossed both LORD OF THE RINGS: THE RETURN OF THE KING and SPIDER-MAN 2 at the Russian box office, eventually taking in more than $16 million. 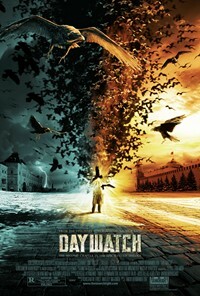 DAY WATCH (DNEVNOI DOZOR) has done even better, grossing over $30 million. Timur Bekmambetov is an acclaimed feature, commercial and video director whose filmography includes THE PESHAVAR WALTZ and GLADIATRIX and who has helmed more than 600 ads for brands including Coca-Cola, Pepsi, Apple, Microsoft, Ford and Procter & Gamble. DAY WATCH (DNEVNOI DOZOR) was produced by Konstantin Ernst, the General Director of Channel One Russia, Russia’s biggest and most successful television network, and Anatoly Maximov, Deputy General Director. The behind-the-scenes creative team includes Director of Photography Sergei Trofimov, Art Directors Valery Victorov and Mukhtar Mirzakeyev, Editor Dmitri Kiselev and Costume Designer Varya Avdyushko. The film’s music is composed by Yuri Poteyenko. © 2007 Fox Searchlight Pictures .. All Rights Reserved.